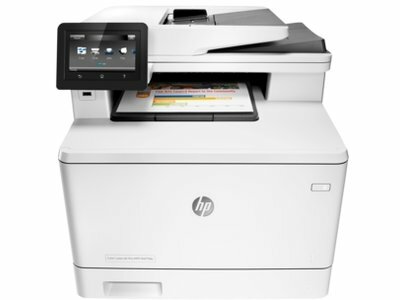 Get your business back on track with this HP LaserJet Pro M477fdn color laser all-in-one. Instead of stocking multiple machines with ink and toner, get more done in less time with this all-in-one machine! Easy mobile printing options help you stay connected while you print from a variety of tablets and smartphones. Prints up to 28 pages per minute in black and in color. Easy mobile printing options help you stay connected while you print from a variety of tablets and smartphones. Scan digital files directly to email, USB, network folders and the cloud with pre-loaded business apps. Up to 600 x 600 dpi resolution in black and color. Makes up to 28 copies per minute. Up to 1200 x 1200 dpi scan resolution. High-speed fax to meet your office needs. HP's JetIntelligence feature delivers faster two-sided printing, faster first page out and reduced energy consumption. Get more pages with Original HP Toner with JetIntelligence. 50-sheet multipurpose tray and a 250-sheet input tray help you tackle printing tasks. Automatic document feeder allows multiple pages to be copied or scanned at once. 4.3" touch screen makes operation quick and simple. Compatible with PC, Mac, Linux and Unix. Shift your office into high gear with a color MFP that doesn’t keep you waiting. Print your first page and two-sided prints faster than the competition, and scan quickly.1 Help keep your device, data, and documents safe—from boot up to shutdown. detbow: Fast and easy setup. I've had other HP all-in-one machines before, but this one out paces them all. I really appreciate the letter option in the front cover. ETTC: Printer works fine but there is constant noise. It will shut off eventually but it takes a long time. I turn it off after I print to stop the noise. yarngal: We print the labels for our products. The printing is crisp, clear, and the colors vibrant. Needed to return a part and that was painless. Most importantly--easy to setup on our network. Yahoo!